As with many holidays, each country has their twist on foods that its people prefer to see on the dinner table when getting together with family and friends. Foods featured during Christmastime in Puerto Rico highlight the island's favorites: roast suckling pig, plantains, coconut desserts, and Puerto Rico's version of eggnog. The island's Christmas favorites are staples that are cooked year-round. They are like comfort food. Most of these dishes can be found throughout the year at restaurants around the island. Take a look at some of the foods you can expect to see on a Christmas menu in Puerto Rico. Carmen Santos Curran, "The 'Rican Chef" and local food expert, explains the breakdown of a typical Christmas dinner. To start are pasteles, a true Christmas tradition. These are pastries, similar to Mexican tamales, which are made of green plantain dough and stuffed with meat, then usually wrapped in banana leaves. The classic Christmas entree is a pork dish, either lechón en la varita (roast suckling pig) or pernil al horno (roast pork shoulder), served with arroz con gandules (rice and beans), green plantain dishes: tostones or mofongo. For dessert, tembleque is an easy-to-make and light coconut treat. You may also be treated to Arroz con dulce (rice pudding) and the ubiquitous flan (custard). To wash it down, make sure to have some Puerto Rican eggnog or coquito. You won't be too hard pressed to find a restaurant open on Christmas Eve and Christmas Day in San Juan. Check out the following restaurant that are all good bets for a delicious traditional meal. Barrachina, the birthplace of the piña colada, also has a Christmas menu including lechón, potato salad, and Arroz con gandules (rice and beans). Its regular menu has pages of seafood, grilled meats, different types of mofongos, as well as local appetizers and desserts that can make your mouth water. For a refined vision of Christmas Eve in San Juan consider the 1919 Restaurant's farm-to-table fine dining take on Puerto Rican classics. At 1919, the restaurant chefs use fresh organic and local ingredients for each dish. 1919 blends the experience of world-class dining with the flavor of locally-sourced ingredients. Following Hurricane Maria in 2017, the restaurant's two locations were up and running in short order, serving rustic, hometown favorites for clean-up workers and reconstruction crews. For Thanksgiving, the menu featured turkey and traditional Puerto Rican sides. With two locations in San Juan, the restaurant's dining rooms are rustic matching the home-cooked feel of the food. For more than 40 years, Dona Ana Restaurant has been serving classic Puerto Rican cuisine with favorites like ceviche, filet mignon topped with caramelized onions, fresh seafood and chicken entrees, mofongo, and a half-dozen desserts. Although it's not a restaurant that features traditional Puerto Rican food, Brazilian steakhouse Fogo de Chao in the Paseo Caribe neighborhood of San Juan, has a Christmas menu and unprecedented views of Condado Lagoon from the second story terrace. If you want a break from local food, you can see how the Brazilian's celebrate Christmas with Fogo's holiday churrasco feast menu on Christmas Eve. The Christmas feast of indulgent bone-in cuts like cowboy ribeye or Vegas-cut New York strip loin, seasoned with fresh herbs and sea salt, is served with Brazilian side dishes and sweet potato casserole. 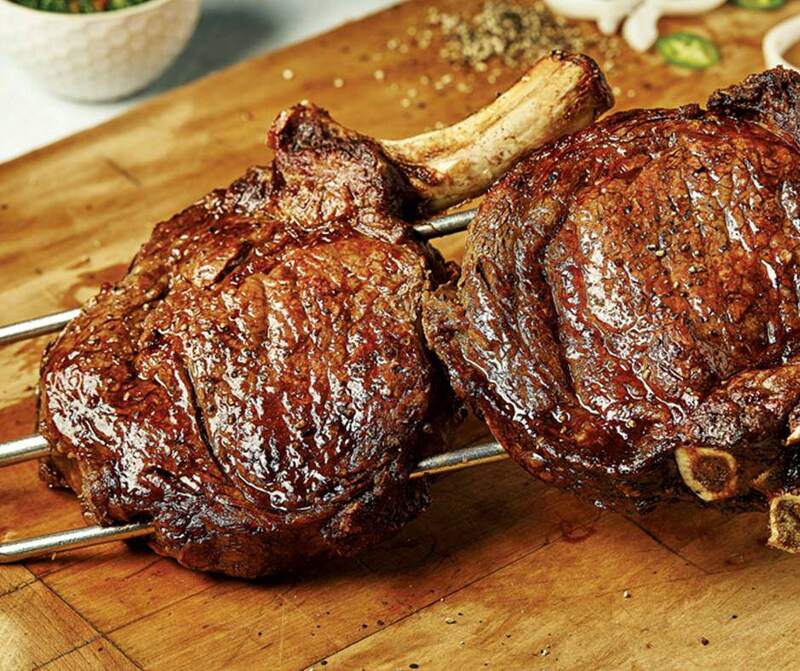 Fogo de Chao was founded in 1979 in Southern Brazil featuring the art of roasting cuts of meats over an open flame and carving those meats tableside by Brazilian-trained gaucho chefs. There are currently 50 locations all over the world.